When was the last time you ordered a whole bottle of wine in a restaurant? It seems as though, except for top celebrations in the most expensive places, most of us these days just sit down and turn right to the Wines by the Glass section. Now, that's finally a good idea. When was the last time you ordered a whole bottle of wine in a restaurant? It seems as though, except for top celebrations in the most expensive places, most of us these days just sit down and turn right to the Wines by the Glass section. Partly, I think, we’re playing a bogus mind game with ourselves: The two of us couldn’t possibly drink a whole bottle of wine for lunch! Then, of course, we proceed to each order a second glass, and—if the restaurant is generous with its pours—a bottle’s worth of wine goes down the hatch anyway. Another theory is a little more meaningful … Everyone at the table is eating disparate dishes, and it would stretch the food-pairing power of any one bottle to go well with everything. The flaw in this scenario is that most of us order our first glass of wine before we even know what we’ll be eating! Still, I’ll cut us some slack here, because it really is true that group dining now often involves a mind-boggling range of flavors, given the combos that fusion restaurants can dish up. What wine could possibly throw a bridge to “kung pao beef sweetbreads & tongue with bacon” and “grilled octopus with peppercorn & tomato sauce”? Order wine separately, and usually by the second glass, we’re all drinking and eating things that go much better together, on average, than if one bottle were shared around the table. This brings us to another solid argument—you can try more wines at one time if you only commit to a glass of each. And some wine lists are so intriguing that it seems a shame not to roam. Only, until recently, if you were exploring fairly esoteric wines by the glass, there would be a good chance that what you got wouldn’t be sound. The bottle might have been opened three days ago, and only a couple of glasses of it were ordered between then and now. The staff was loath to pour half a bottle down the drain, so they served it even though it was too oxidized. Even though the concept of offering wines by the glass has had the above arguments to recommend it from the get-go, oxidized wine has been a serious glitch along the way. The second is a new, fool-proof version of the Coravin, a device that inserts a needle through the cork and withdraws a desired amount of wine without opening the bottle. A little inert gas shoots in to take the place of the missing wine (to keep oxygen at bay) and, voilà! The rest is preserved. 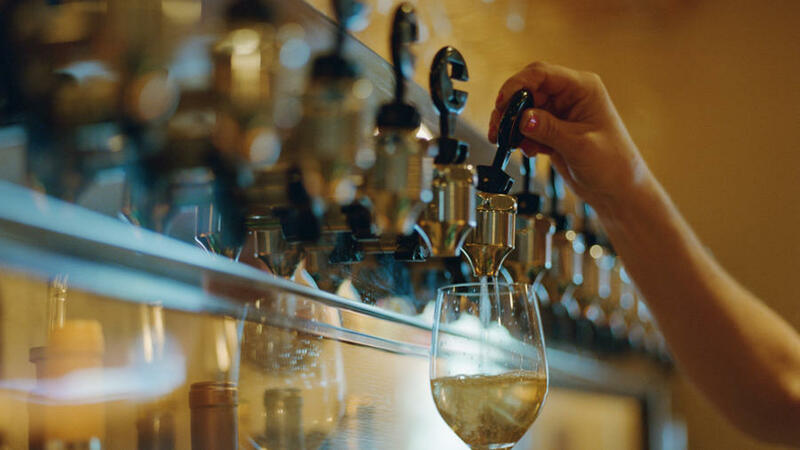 That means restaurants can offer even valuable wines by the glass without risking waste. If you spot extra-interesting (and probably extra-expensive) wines on a by-the-glass list, that’s probably what’s going on. Ask the somm, just to hedge your bets. As for wines on tap, here are some brands I’ve seen coming from kegs that I especially like (the wines, not the kegs). Order away! Chehalem—racy dry Riesling and earthy Willamette Valley Pinot Noir. Dry Creek Vineyard—beautiful Sauvignon Blanc and old-vine Zinfandel (to say nothing of Bordeaux varieties) from Sonoma. King Estate—especially look for their Pinot Gris, a bar-setter in Oregon. Tablas Creek—bright, minerally white and red Rhône-style blends out of Paso Robles. Tangent—a line of lovely, crisp alternative whites from San Luis Obispo County’s Edna Valley (think Grenache Blanc, Albariño, Viognier, Pinot Gris … ).